WilmerHale is honored to be the recipient of the inaugural Honor Roll Award given by ChIPs at its annual Women in Tech, Law, and Policy Global Summit held October 17-19 in Washington DC. Across the firm, women fill important leadership roles with clients and on case teams. Of the eight cases tried by the firm in the past year, women led or co-led five of them and of those five, three were IP lawyers. WilmerHale women also made eight appellate arguments in five different courts of appeal, including two arguments in the US Supreme Court, of which two were IP matters. Also, women comprise 25 percent of WilmerHale's partnership—a number which is much above average for the industry. Consistently recognized for its dedication and accomplishment when it comes to workplace diversity, WilmerHale received the following recognitions since this summer: Law360's 2017 Glass Ceiling Report recognized WilmerHale as a best law firm for female attorneys and a “ceiling smasher” for female equity partners; the firm was also named a Best Law Firm for Women for the 10th consecutive year by Working Mother magazine; received a fourth Gold Standard Award from the Women in Law Empowerment Forum (WILEF); and announced a partnership with Diversity Lab to pilot the Mansfield Rule, which seeks to ensure greater diversity of women and attorneys of color in candidate pools for recruiting, promotion, and leadership opportunities within the firm. ChIPs is a nonprofit organization focused on advancing and connecting women in technology, law and policy. ChIPs seeks to accelerate innovation in these areas by increasing diversity of thought, participation and engagement. At ChIPs, members are united in the belief that diversity, of all types, is essential to innovation and to a thriving, evolving society. Founded in 2005 by seven women chiefs of intellectual property, it has expanded beyond those roots, now with over 2,000 members and seven regional chapters in the United States and abroad. Many members are engaged at the heart of current events—as active participants in the lawmaking, policymaking, judicial, advocacy and innovation processes. Learn more about WilmerHale's Women's Leadership Initiative and diversity efforts. 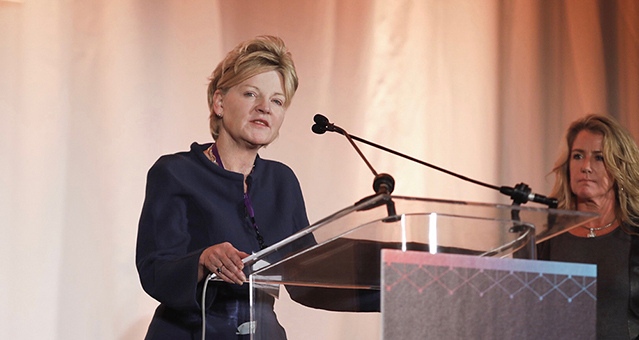 Susan Murley speaks at the 2017 ChIPs Global Summit after WilmerHale was announced as the recipient of the inaugural ChIPs Honor Roll award (Image by Tracey Salazar Photography).